A brief review of this past year and a look ahead to 2013 as the industry forges forward with new opportunities. XTAR LLC, the first U.S. commercial provider of satellite services in the X-band frequency, announced that it has gained a significant segment of the growing airborne intelligence, surveillance, and reconnaissance (AISR) market over the last 12 months. These contracts represent more than 100 MHz of bandwidth and are valued at more than $8 million. Pentek Inc. announced the new Talon® RF/IF signal recording and playback system: the Model RTR 2727 rugged portable recorder suitable for military and aerospace applications. The system features recording and playback of IF signals up to 700 MHz with signal bandwidths to 200 MHz. It can be configured with 500 MHz 12-bit A/Ds or 400 MHz 14-bit A/Ds and an 800 MHz 16-bit D/A. Ducommun Inc. announced that it has received a contract from The Boeing Co. to produce titanium detail components and subassemblies for the Boeing 787 Dreamliner. Under the terms of the contract, production on the titanium assemblies will continue at the Ducommun AeroStructures facility in Coxsackie, NY. Cobham has been selected by Inmarsat as a "Launch Partner" to provide land-based satellite communication terminal antennas specifically designed to support the global service introduction of Inmarsat's Global Xpress® (GX) network. 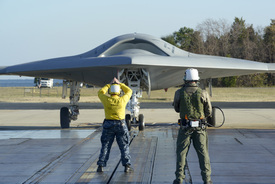 Northrop Grumman Corp. and the U.S. Navy have conducted the Navy's first catapult launch of an unmanned system using the X-47B Unmanned Combat Air System (UCAS) demonstrator. ITT Exelis announces agreement to acquire C4i Pty. Ltd.
ITT Exelis has signed a definitive agreement to acquire C4i Pty. Ltd. (C4I) based in Melbourne, Australia, from the Longreach Group Ltd. for an enterprise value of approximately USD 16.8 million. Pending Longreach Group shareholder approval, the transaction is expected to close in the first quarter of 2013 subject to customary closing conditions and regulatory approvals. The acquisition is not material to Exelis 2012 results. The U.S. Navy announced that the Danish government signed an official letter of offer and acceptance formalizing its intent to buy nine MH-60R SEAHAWK® helicopters and comprehensive logistics support for its Maritime Helicopter Replacement Program. Raytheon BBN Technologies has been awarded $16 million under the Deep Exploration and Filter of Text (DEFT) program, sponsored by the Defense Advanced Research Projects Agency and the U.S. Air Force Research Laboratory. BBN Technologies is a wholly owned subsidiary of Raytheon Co.